That may also be when users report others maliciously, or when there’s a misunderstanding around the context of a tweet. To enable faster appeals, Twitter’s new process will be completely manageable within the app. Up till now, any appeal of such action needed to come via an online form. 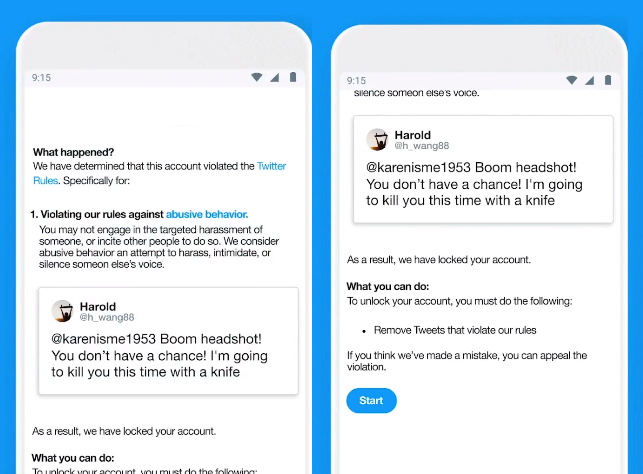 The first point of the new report flow is that Twitter will inform the user of the reported tweet, along with the rule it’s believed to have violated. As you can see here, the process also includes links to the relevant rule documentation so you can get a better understanding of the specifics. You can then either delete the tweet or appeal the decision by tapping ‘Start’. The first option you’re then presented with is to remove the tweet in order to restore access to your account. This is the most common response to such reports – if there’s an issue, most users simply remove the tweet in question and move on. As noted, up till now, if you wanted to take it further, you had to go fill in a specific form, but Twitter’s updated process includes a link to submit an appeal within the app. As you can see here, you then get another screenshot of the tweet in question with a description of the specific rule it’s believed to have violated. Tap ‘Next’ and you’re taken to the appeal screen, where you can submit an explanation for the tweet. 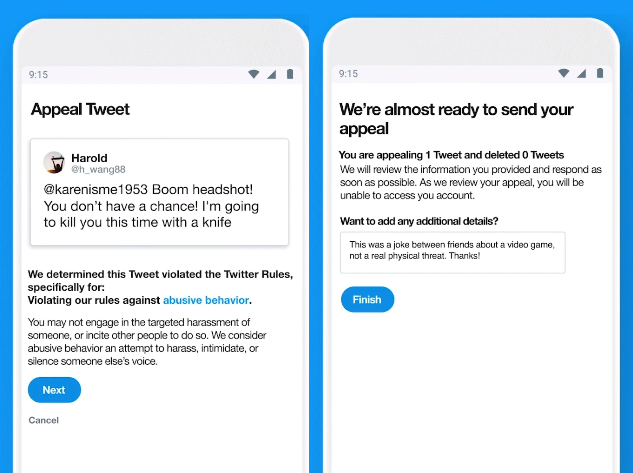 Not only does this make the tweet appeal process easier, but Twitter says that it also makes it faster for their teams to process – Twitter says that, through this, they’ve been able to get back to people 60% faster than before. This was posted some time ago, and Facebook has significantly upgraded its moderation workforce since then (as has Twitter). But it does provide some understanding of the issues these teams are dealing with, and how smaller violations are not always the priority. It’s on the platforms to enforce their rules, and to have enough people to deal with such, but if your issue is minor in comparison, you can see how it may get pushed down the line. That said, the more social networks can streamline such, the better, and Twitter’s new process aims to do exactly that.